F-5B 64-13377 of 349mira, stands on the EOR at Larissa in July 1995 whilst the pilot does his final checks before take off! 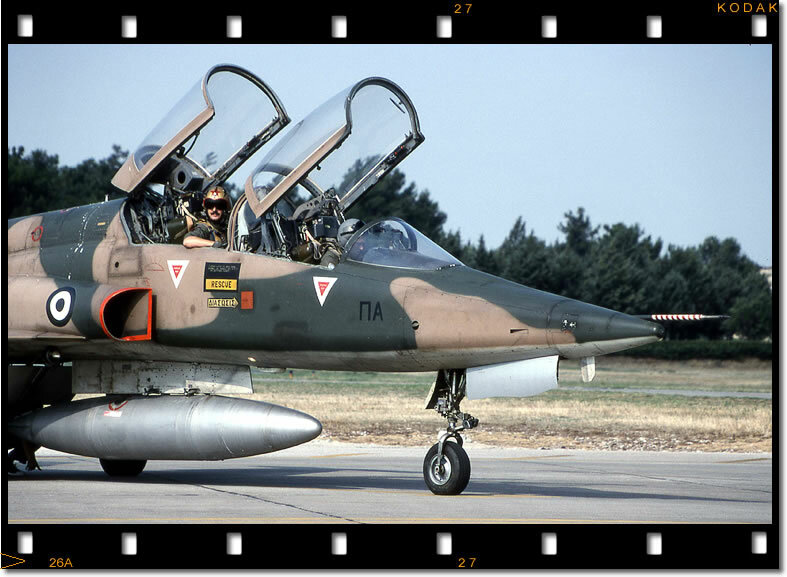 Considering the events of the last 12 months, I guess I am very fortunate to have had an exceptional photographic tour of nearly all of the Greek Air Bases!! I could have easily filled my 7 shots of this portfolio with shots from this interesting Airforce! Thanks Ian!!! 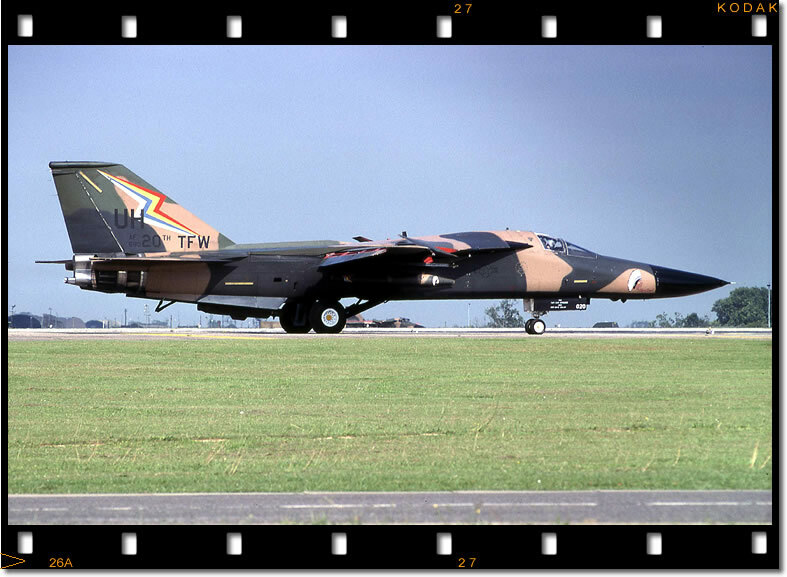 68-0020 "20 TFW".... "The Chief" holds awaiting clearance to depart from runway 27 at RAF Upper Heyford, on 02nd July 1991. This shot was taken from outside of the base in the field at the Ardley end of the airfield. What a tragedy the base has closed!! 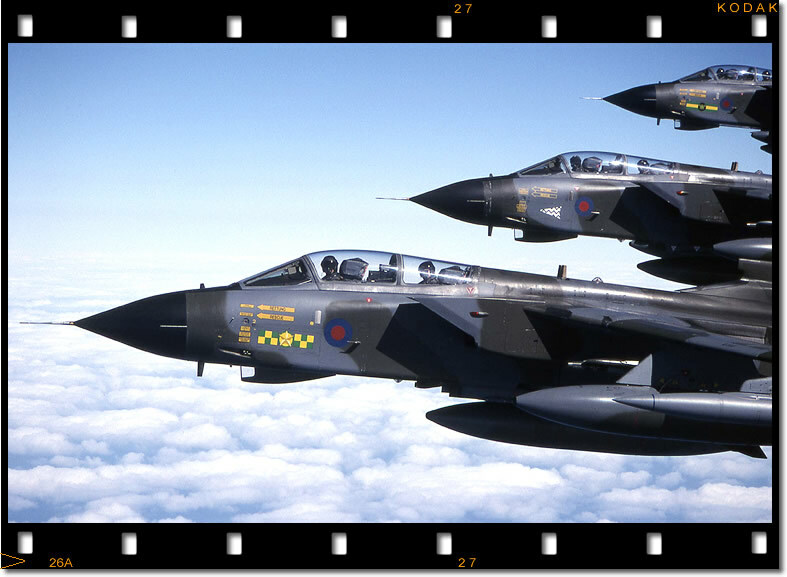 Three Tornado GR 1's from RAF Bruggen, form a stack for my camera on their way from Lajes to Goose Bay on the 01st April 1998. Flown by crews from 31 Sqn the three aircraft were en-route to Goose as part of the annual "Western Vortex" low flying detachment. 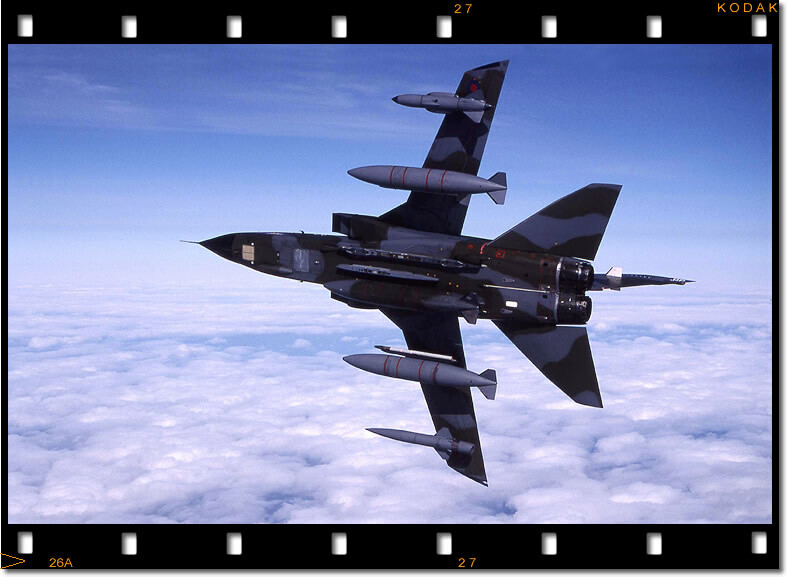 The nearest Tornado wears the markings of 31Sqn followed by 17Sq and 9! 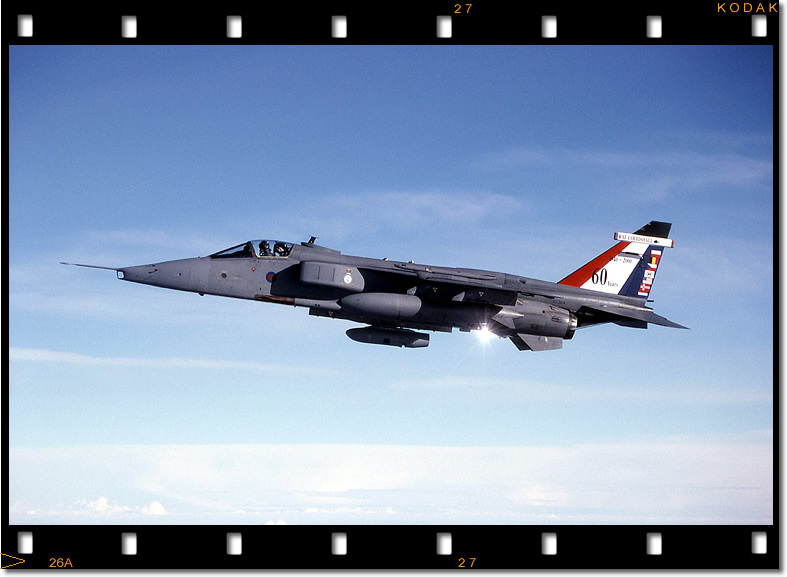 Photographed over the North Sea, from a 216 Sqn Tristar on the 12th Oct 2000 was this Jaguar GR3, XZ364, wearing special anniversary markings, to commemorate 60 years of RAF Coltishall. At 17,000ft above Germany on 06th Feb 2001, 37+37 an F4F from JG72 at Hopsten, attempts to RV with it's tanker, KC-135R 37979 of the 100th ARW, in the "SAXON" air refuelling area located to the south of Leipzig! Just before a winter sunset, the low light shows off the classic lines of the Phantom! 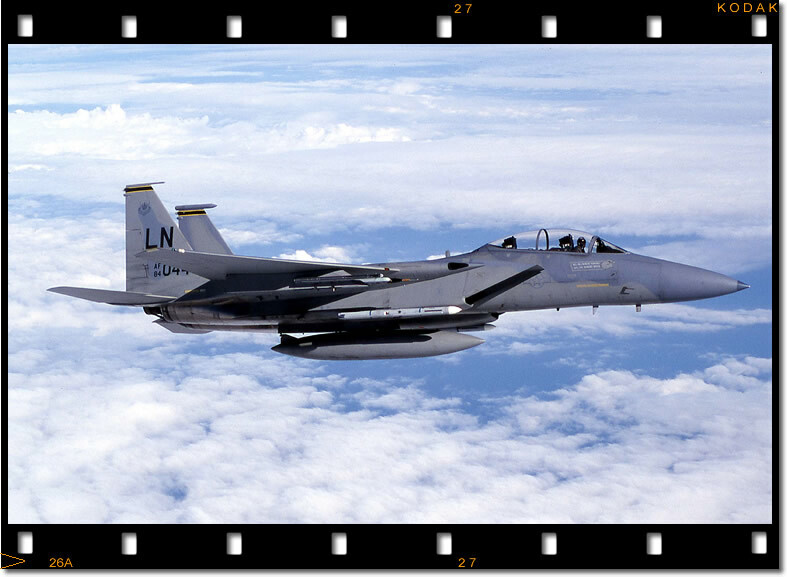 Returning to it's home base at Lakenheath after a morning mission on the North Sea ACMI range on 30th March 2001, is this F-15D 84-044 of the 493rd FS. It always seems to me a real waste to have an empty back seat!! Breaking hard before descending to make an approach at Lajes Field in the Azores is ZG794, a 14 Sqn Tornado GR1. On this day it was flown by a crew from 31 Sqn who were taking the aircraft, along with four others, to participate in Exercise " ASCIET 99" which was centered in the state of Georgia, USA. I picked up the Military Aviation bug in the late 70's! Living near to Upper Heyford, the air over my house and school would frequently vibrate with the sound of Jet noise from F111's and the various other aircraft, departing from the North Oxfordshire base. In my early years, during the school holidays or at weekends, I would regularly cycle or cadge a lift so I could spend time with friends sitting on the end of the runway at UH! In those days you could regularly see anything from common things such as pairs of Canadian or German Starfighters to the more exotic like half a dozen US Navy Prowlers!! In those early days, my activities were basically limited to spotting, but towards the mid-80's after leaving school the funds were available to invest in some decent camera gear! My first camera was an Olympus OM20, which was very reliable, easy to use and produced some pretty good results. This was quickly followed by an OM40 to allow for shooting trannie and print! Since those early days I've changed my gear and now use Canon AF kit. I still have a fondness for Olympus and still have one in the shape of an E-10 which I use for digital shots!! I guess the hobby has been rather kind to me over the last 25 years that I've been "doing it"!! 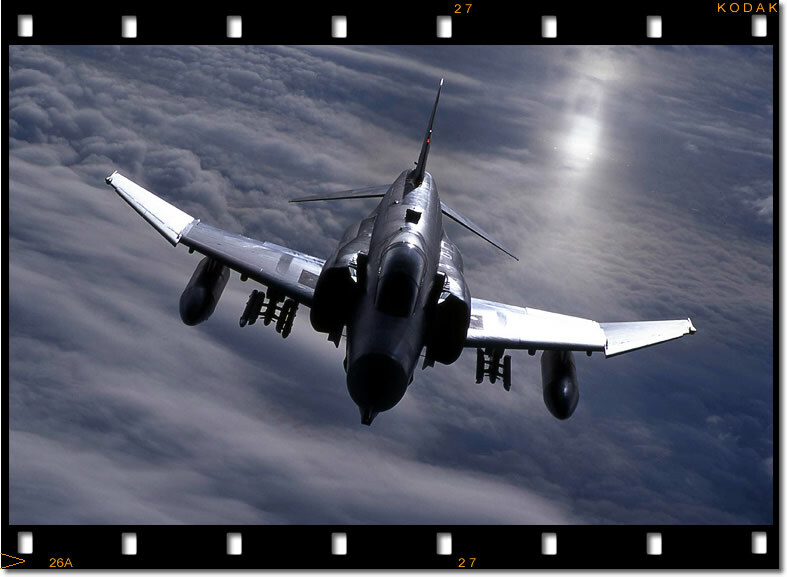 I had my first aviation picture published in 1990, it was of a Phantom (38+59) at Wittmund in Germany, (thanks, Hartmut and Thorsten!). Since then I've never looked back and through a combination of, alot of hard work, time and effort and an understanding family!. I have been to lots of interesting and exotic places and as a result have had many wonderful experiences and made some very good friends along the way. Subject wise, I am probably quite unusual in that I like RAF stuff!! I also really enjoy working with Helicopter's!! I know call me weird!! My favourite fixed wing aircraft has to be, one of any variant of the F111 family, closely followed by the majestical VC-10! Like most people I used to like the USAF. But my affinity for them was severely dented when they closed Upper Heyford! Don't think I will ever forgive them for that!!!!!!!! !